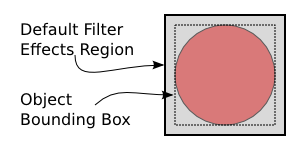 All filters can be defined and applied through the Filtri dialog. The Sfocatura Gaussiana filter can also be used directly through the Riempimento e Contorni dialog. The Miscela filter can also be applied to an entire Livello through the Livelli dialog. The Riempimento e Contorni dialog has a Blur slider that when moved from zero, creates and attaches a Sfocatura Gaussiana filter to selected objects. If the slider is reset to zero, the filter is automatically removed and deleted. The same principle works on the Livelli dialog where a choosing anything but Normal creates a Miscela filter and attaches it to the Livello. Setting the drop-down menu back to Normal deletes the filter. All Filtri primitives can be used through the Filtri dialog. In this dialog, Filtri must first be declared and then applied to selected objects. Complex filters can be composed by combining Filtro primitives to create new effects such as a «Drop-Shadow» filter. Source Graphic. Use the object as the source for the Filtro primitive. Source Alpha. Use the Alpha of the object as the source for the Filtro primitive. Background Image. Use the region under the Filtro at the time the Filtro is invoked. Background Alpha. Use the Alpha of the region under the Filtro at the time the Filtro is invoked. Fill Paint: Not implemented. Use the Riempimento of the target object as the input to a Filtro primitive as if the object had an infinite extent. Useful if the Riempimento is a Gradiente or Motivo with transparent or semi-transparent regions. Stroke Paint: Not implemented. Use the Contorno of the target object as the input to a Filtro primitive (see Fill Paint above). The Filter Effects Region can be defined in terms of the object's quadro delimitatore or by units in the current user coordinate system by setting the «filterUnits» parameter to «objectBoundingBox» or «userSpaceOnUse». Inkscape currently supports only the use of the first in the GUI.